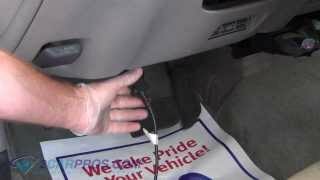 Is this the center air bag sensor your trying to change? There you I posted the diagrams and instructions. So if you click on the images they dont enlarge to read them?I can email them if you need me too?Looks like the bottom bolts come out. There is limited info on a lexus that old I posted as much info on that as I have on removal. I was asked to see if I could help you out. Here is the info I have. HINT: Tape a screwdriver tip before use. (a) Using the screwdriver, pry out the cluster finish panel, and after disconnecting the connector, remove the Panel. (b) Using the screwdriver, pry out the lower console cover. (c) Using the screwdriver, pry out the cover. (d) Remove the 3 screws and lower console box. (e) Remove the 4 screws and cup holder. (f) Remove the 4 screws and the console box. Not everyone is a expert on every make of car on here that would be impossible. Dont worry I have help coming your way I emailed a few of are experts on here. Don't know what else to add you have covered quite well. I have been working on cars my whole life and run an auto auction. I don't sit behind a desk and I certainly have a lot of mechanical experience. I was looking for (hidden bolts or screws) that can be seen. Obviously because you sit behind a computer all day and look at pictures you assume that your instruction are self explanatory. You pictures don't even match my car. Left bracket, what do I have to remove to get the bracket out? Lower bolt is obvious, upper cant be seen so obviously something has to be removed? What? Center console, I have removed all screws I can see, but the rear of the console wont lift off, hidden bolts? Nothing in view? I ask your company for information so I don't spend time taking things off I don't need to. Most of our Experts are working technicians that basically donate their time considering how much it actually costs to have a mechanic even look at your car. We are here to help people in need. We understand your frustration when diagrams for your year/make/model don't match what you are looking at. We use the most current technical repair information and schematics available and sometimes they are not exact. Hidden bolts under the dash can be difficult to locate and sometimes require the removal of the center console and parts of the dash to gain access to them. Maybe you could post a picture of what you have done so far so our experts can provide a solution. Our satisfaction guarantee is unconditional, we will be glad to refund your donation if we can't get it figured out for you.